Free career interest test is a free version of career inventory or interest inventory administered to understand your occupation interests. A good career interest test briefly reports your career or job interests and suggests a number of career options for you to choose from. If you want to change careers interest testing can offer help. A career interest survey examines your liking or preference for certain work activities. There are online free career interest tests available. 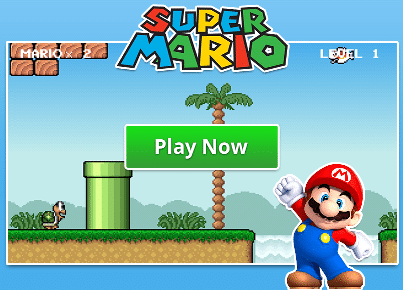 As with any other free services you can expect that the quality varies greatly. You want to find reliable interest surveys with relatively comprehensive reports covering a range of careers. There are short and long career interest tests, from 60 up to 180 questions, with 3-5 answer choices for each question. The interest inventory surveys take between 10 to 15 minutes to complete. Once you’ve done with the test you’ll get an overview of your scores on the six general occupational themes. O*Net Interest Profiler claims that their assessment tool can help find out what your interests are and how they relate to work. For the purpose of changing careers you may want to pick a future job zone that matches the amount of experience, education and training that you plan to get in the future. There are 5 job zones for you to choose from, starting from no job preparation to extensive job preparation. 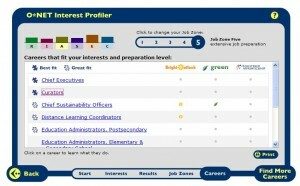 For example, I picked a job zone 5, which needs an extensive job preparation, and got the picture above. From that point, I could explore each career suggestion by clicking on the blue links. Take the O*net Interest Profiler! Paid Or Free Career Interest Test? As free career tests only give general overviews of your occupational interests you should never make any decision based on free test results. General career profiles could mislead your career choice. For this reason, you will need to buy paid career interest test reports. For more extensive report you want to buy a career interest test that offers in-depth occupational interest patterns. The assessment will help you to show where your true career vocation lies – Computational, Science, Mechanical, Medical etc. Learn and take career interest tests!